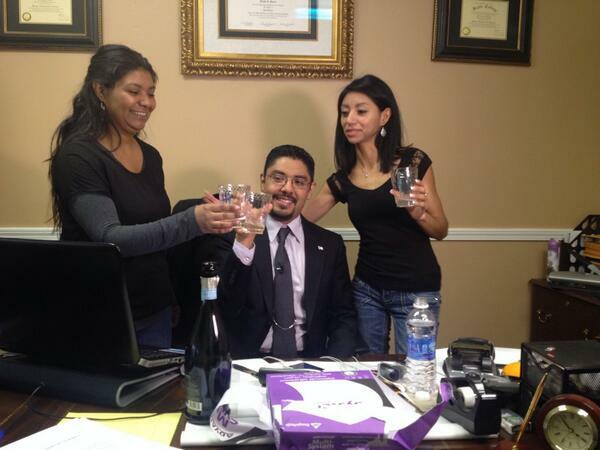 Sergio C. Garcia passed the bar exam on his first try, but he was unable to practice law until now. Sergio C. Garcia, who went through a protracted journey since passing the bar exam to become a lawyer, can now practice law after the California Supreme Court ruled the undocumented immigrant can be given his license. "With tears in my eyes I'm happy to report I am being admitted to the bar, thank God!" a jubilant Garcia wrote on Facebook. "This one is for all of you who dare to dream and by doing so change the world! Love you all! History was made today!" Code, "that generally restricts an undocumented immigrant's eligibility to obtain a professional license but that also contains a subsection expressly authorizing a state to render an undocumented immigrant eligible to obtain such a professional license through the enactment of a state law meeting specified requirements." After the California legislature enacted a statute intended to satisfy this aspect of the law, signed by Governor Jerry Brown, which went into effect Jan. 1, 2014, the court decided Garcia could receive his license. Garcia, 36, was born in Mexico and brought to the U.S. when he was 17 months old, according to NPR. He moved back and forth until he came to California permanently when he was 17 and was approved for a green card because his dad had one. He was told he would get his own green card when one became available, and he's been waiting for 19 years. In the meantime, he worked his way through college, law school, and passed the state bar exam. David Leopold, former president of the American Immigration Lawyer's Association, said he believes this ruling will set a precedent for similar cases in other states. "There is a growing recognition that undocumented Americans are an intrinsic part of our social fabric; that the lack of a document should not prevent a talented lawyer from serving his or her community," he told BuzzFeed. "California has set an important precedent that hopefully will be followed by other state governments. The case also underscores the need for Congress to finish the job of fixing the broken immigration system," he said. Garcia, who celebrated by having champagne with his family Thursday morning, remembers giving his mom his law degree for her birthday because he was broke and didn't have anything else to give her. For him, the court's decision is a dream come true. He said he wants "to finally work to my full potential, to contribute to this great country that has become my own." And what does he want to do now? What every red-blooded American aspires to do after winning big. "I finally want to go to Disneyland, I'm 36 years old and I haven't been," he said. Before the decision came down, he said his ordeal would be a positive for others in his situation. "I'm out to prove that, yeah, even one person alone can make that difference. One person can open a door to a great possibility for the rest of the people."